How many times have company employees experienced a situation where key equipment either in a building or in a manufacturing plant has broken down and everyone is scrambling to find out what happened? In such a scenario operations crews are under intense pressure to get the broken system up and running as soon as possible. These stressful events occur more often than they should. In the realm of key electrical systems, performance and equipment life expectancy are impacted by environmental conditions, overload conditions, and excessive duty cycles. Most organizations have gaps in their electrical infrastructure maintenance practices. As a result, Total Cost of Ownership (TCO) of equipment rises as downtime instances increase. Most companies pursue a “reactive” approach to maintenance which involves fixing equipment only once it breaks down. In fact, some 55% of building owners and operators in the United States rely on this “break/fix” maintenance approach to care for their equipment. By avoiding to pay for maintenance charges after a product’s warranty expires they believe it is the least expensive method for supporting the installed asset base. In fact, the opposite is true. Compared to the more planned methods of maintenance, such as preventive (scheduled) or predictive (real-time monitoring) maintenance, reactive (break/fix) maintenance, is the most expensive approach. By waiting until actual failure, operators ensure that repair/replacement costs will be at a maximum and that interruptions to service will be lengthy. Technology and business are evolving in such a way that uptime is becoming more critical than ever. Downtime costs are skyrocketing with average businesses suffering losses in the hundreds of thousands of dollars each time a key system goes down. New products with built-in connectivity are replacing the older “dumb” devices. Therefore, since the newer systems are much more automated and “connected” than they were in the past, the sphere of influence of a downtime incident is much wider. Trends such as the “Internet of Things” (IoT) exacerbate the problem. The business benefits of having more and more systems connected are apparent from a productivity and efficiency perspective. However, from a maintenance point of view, unanticipated downtime in these connectivity-rich environments translates into an “out of business” strategy. The cost of downtime can be reduced by substituting reactive maintenance with an optimized combination of break/fix, preventive, and predictive maintenance. Preventive maintenance is a less expensive option than reactive maintenance but more costly than predictive maintenance. A preventive maintenance approach involves regularly scheduled inspections of equipment, regardless of whether the equipment requires fixing. In a preventive maintenance scenario, machines are stopped or devices are shut down in order for maintenance people to go in and check the state of the equipment. Depending on the environment, this might happen four times a year, during times that are the least disruptive to the business. In a predictive environment, the equipment is monitored on an ongoing basis. “Vital signs” are kept track of. If an uptick in temperature begins to manifest itself, a detailed diagnostic is performed and a calculated estimate of remaining uptime is projected based on historical trends. That estimate recommends the best time for when that machine or component will require a fix (prior to breakdown). Thus, instead of four interruptions to component uptime in a given year, that device may only have to be taken off-line once to implement the fix. This helps to minimize costly interruptions to process systems uptime. 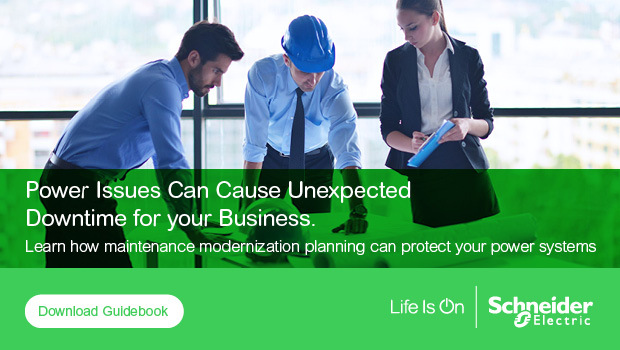 For more details on helping to justify a move away from a break/fix approach, download the Schneider Electric white paper entitled “A Comparison of On-demand vs. Service Plan Electrical System Maintenance Programs”.